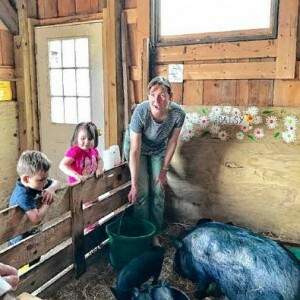 CHARLEMONT — Hawlemont is a school where everyone does farm chores, so it’s no big deal for the school principal, on a summer afternoon, to feed the school’s 19 chickens and five piglets before ending the day. “The staff take turns, when school’s out,” explains Samantha Rutz, just six days into her new job as principal. Although her job began July 1, Rutz has been coming to the Hawlemont Regional School for the past two months, working with former Principal Dwayne Kermenski, who took a job in Vermont. This past year, Rutz taught seventh-grade science at the Mohawk Trail Regional School and won a Franklin County “Science Educator of the Year” award from the state Association of Science Teachers. Rutz comes to Hawlemont at a time when the 3-year-old HAY (Hawlemont, Agriculture and You) curriculum is showing measurable success and growing student enrollment. In its first year, the HAY program saw a 10 percent enrollment increase; last fall, enrollment grew by 30 more students. This school year, when the children from the closed Heath Elementary School come to Hawlemont, Hawlemont is expected to have about 160 students.